Is it a portent that the Christmas period 2012-2013 has been exceptionally quiet on the new brochure front? Normally at that time of year, the Postie is cursing me for being the cause of a bulging sack, but this winter, it's been strangely quiet. One notable absentee did have a valid excuse. 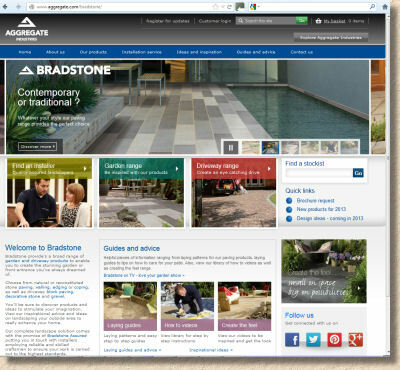 Bradstone called before the holiday break to suggest that I might prefer to wander down to their HQ near Ashbourne in Derbyshire as they had summat they'd prefer to show me 'in the flesh' as it were, rather than have it sprung on me unannounced in the forthcoming 2013 catalogue. So: we made a date for the first Tuesday back at work in 2013. A couple of days prior to the journey down to Derbyshire, the Bradstone Twitter feed had let slip a link to some new content on their website, and being the curious type, I had a nosey and pretty quickly guessed what it was they wanted to show me….and why! Ostensibly, the visit was intended to be a guided tour through the new brochure and new products, along with a rough outline for the company's plans for 2013, but the enormously huge pachyderm loitering in the corner of Aggregate Industries' Hulland Ward boardroom could not be ignored for long. What was this Patio Deck™ and why? The new products team admitted they were nervous about showing it to me, as I have somehow acquired a reputation for being a tad outspoken, and so it was all carefully managed with a gentle introduction by video, repeated assurances that a select band of distributors in the Builders' Merchanting fraternity loved it, and that they felt the company had to do something distinctive and different for what has unintentionally become quite a stagnant market. The perception is that the patio and driveway sector has been too quiet for too long, keeping its head down in the hope that the recession won't notice it's done buggerall for five years, but now Bradstone feel it is time to liven things up a bit. So, what is this Patio Deck™? It looks bloody complicated. Complicated but simultaneously intriguing. Let's approach it with an open mind…. Essentially, it's a 'lay-over' installation system. The kit comprises a lightweight mild steel framework which is plonked down on the existing garden or yard area, levelled up using screw-adjusted pedestals, and then the flags are, and I kid you not, glued into place atop the framework. Now: stop all that sniggering! When you start to drill down into the thinking behind the product, and the economics on which it rests, it starts to make a lot more sense, and, more importantly, it offers the prospect of some very interesting developments. It comes in 8m² packs, supplied as five of the pre-constructed steel bases which are screwed together (everything bar the screwdriver is supplied) to create a rectangle measuring 1.8m x 4.5m (4 flags by 10 flags although other configurations are possible). As already mentioned, the assembled base is levelled up using simple but sturdy screw plastic pedestals which, in turn, sit on top of the supplied concrete padstones. The pedestals are adjusted to roughly level-up the base and ensure it doesn't rock or move, and then the edging skirt is glued into place to hide the framework. After that, it's simply a matter of glueing the rather lovely Panache 450x450mm flagstones into place in a basic stackbond pattern. The glue has been tested in all sorts of conditions and they are confident it can survive anything the British weather can throw at it (which basically means lots and lots and lots of rain). The skirt is non-descript but functional, with the benefit of having proper 90° corner pieces, and once assembled the whole thing looks absolutely fine. Not stunning; not drop-dead gorgeous; not delicious; just fine. But that's the whole point! It's not intended to look anything other than how a stackbond pattern Panache patio would look if laid in the more traditional manner, except that it's elevated by around 150mm. Now, consider what's been done here. With the exception of the small padstones there has been no excavation. No digging, no wheelbarrowing, no skips or grab-wagons, so how much dosh has that saved? Further, the whole thing can be, and has been, assembled by cack-handed no-discernible-practical-skills marketing types in less than 90 minutes. In one 'race', a team of BM counter staff had it done in under 10 minutes (no glue was harmed in the making of the assembled patio). There's no jointing. The flagstones are elevated so the whole shebang could be placed right outside a patio door to give that much-desired 'level walk through' with no risk of compromising DPC levels. The base doesn't even need to be perfectly level or to fall in a particular direction because surface water passes through the open joints to the bare ground below. Individual flags could be omitted to be replaced by decorative aggs or boulders. Lighting can be fitted with ease, and cables run through the steel structure almost effortlessly. Multiple packs can be bolted together to create larger areas. Aaah, but how much does all this convenience cost? 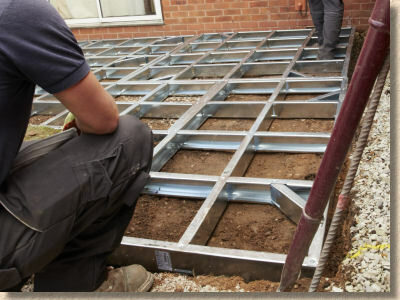 Steel framing, pedestals, skirting, fixings, glue and not to mention the flagstones, plus delivery direct from Bradstone Towers, that's got to add up to a pretty sum, hasn't it? Have a guess….go on! Well, it should come in at around 100 quid per square metre. 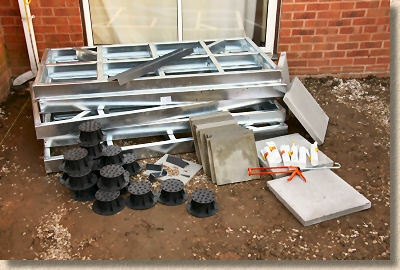 How many contractors could supply and install an 8m² patio using premium quality paving for 800 quid? It's a bargain! Fair enough, once you have, say six packs and 48m² to cover, 100 quid per m² seems pricey, but that's not where this system is aimed. If you want 48m² of Panache paving, you do it in the traditional manner using a suitably experienced contractor, but for those sub-20m² pain-in-the-arse jobs, it's ideal. What about mews houses where everything would normally have to be trudged through the living room? Barrowfuls of earth going out, barrowfuls of sand and cement coming in … all this could be a thing of the past! Think too about where this could lead. Initially, it's only available with the Panache paving, but if it's successful, what's to stop it being used with any of the other flagstones? Natural stone? Inset trays for mini-planters, bespoke lighting units, feature panels? All could be possible. 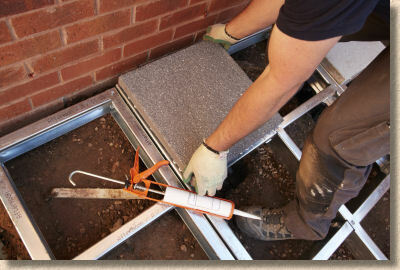 So, the natural assumption is that it's a DIY product, and to be honest, I suspect that's where most sales will come, but as a contractor think about the possibility of being able to go in to a customer's home and install a neat looking mini-patio in under two hours, with no mess, no fuss, no hassle. You could do three a day! Patio Deck™ has a lot going for it, but it is not going to be an easy product to sell. Getting the trade and, probably more importantly, the DIY crowd, to see that it isn't a gimmick will be bloody hard work. Britain is a notoriously conservative (small c) nation when it comes to paving innovation - just look how sodding difficult it has been to get the country to accept shaped pavers! There have been similar ideas in the past which have had their merits but have ultimately failed because the company behind the idea didn't have the resources to withstand the initial scepticism and then invest in serious hard-hitting marketing. 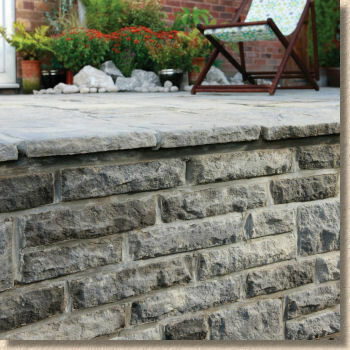 There are very few manufacturers in Britain that could, but it's fair to say that Bradstone are one of them. It's certain to attract strong opinion. I know some will dismiss it as a contrivance, but that's too easy. At a time when our trade needs any help it can get, maybe a different approach to installation of small projects is what we need to stimulate interest. I don't for one second think it's going to take the world by storm, and I don't envy Bradstone the task of selling this into a cautious and cost-conscious market, but I think it certainly deserves a chance. 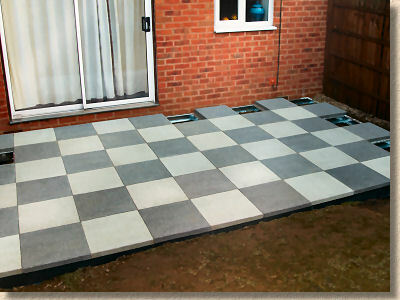 Patio Deck™ should be available from February – bought via the usual suppliers but delivered directly from Bradstone to the site. 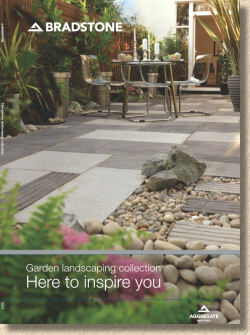 Given all of the above, it would be easy to think that Patio Deck™ is all there is to say about the 2013 brochure, but there's more. Not a lot more, admittedly, but a couple of other items that warrant a mention. Firstly, I know I've struggled in the past to get my head around the Bradstone-StoneFlair-BorderStone merry-go-round, but just as I think I've more-or-less got there, they decide to rationalise the ancient bedrock of the brands with yet another re-jig of the reproduction riven flagstone offering. To recap, StoneFlair is now the premium brand within Bradstone, a bit like 'Finest' is the premium brand for Tesco stuff, but once that had been sorted, it became apparent that there were just too many riven product lines, some of which are original Bradstone, some which came with StoneFlair and some that once resided with Border Stone. So, to tidy things up ever so slightly, there is now to be one dominant 'mid-range' line which is to be known as Ancestry®. It's not as fancy-dan as Cloisters, but not as basic as Weathered Riven. However, exceedingly similar lines, such as Bamburgh Mill and Old Town will remain, so it's not immediately apparent how much tidying-up has actually been achieved. Three colours and six modular sizes in the flags, so a reasonable degree of variation and versatility, but using names such as Abbey Original for the colour options doesn't help clarify anything. If it had been Ancestry Original, or just Ancestry Buff, I wouldn't be quite as confused, but just where has this sodding Abbey come from? Still, the Ancestry® range is augmented by having its own complementary walling, copings and edgings, so that a single range can be used to provide all of the hard-landscaping within a particular project. That *does* make sense, but I feel there is a way to go with the rationalisation. The wannabe French limestone-like Gironde is now a colour within Old Town, but Old Riven persists, as does Ashbourne and Restoration. The paving trade has had a tough few years of late, and no sector has had it tougher than reproduction riven flags. You need some serious cojones to keep flogging this stuff in the face of the show-no-mercy onslaught from ridiculously cheap imported natural stone. To continue selling a budget, a mid-price and a premium range demands serious commitment: to keep on with six or seven variations-on-a-theme is verging on madness. I can't say I'm overwhelmed with Ancestry®. 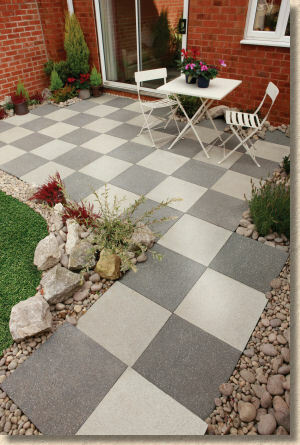 It's a mid-range concrete patio flag that costs more per square metre than the natural stone it attempts to ape. Unless the price of imported stone starts to rocket (and that's not all that unlikely!) I don't know how much of a future there is for this type of product. I've loved StoneMaster since it was first revealed to me in the boot of a car outside a budget hotel in Coventry several years ago and long before it hit the market. It's just one of those ideas that you immediately know has legs. Since then, there has been relatively little progress, which I feel sure is due entirely to the economic climate. 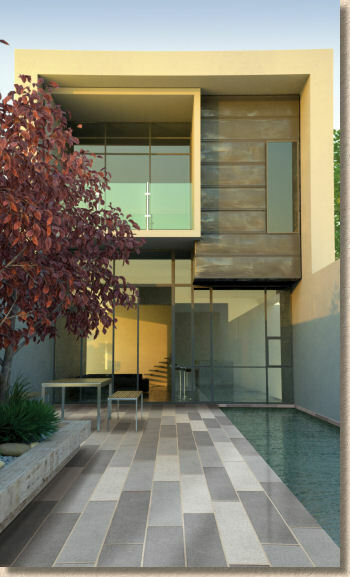 This is such a versatile form of paving which promises much once the market conditions are right, so the move to create a long aspect version is sensible and very welcome. It keeps the brand fresh while opening new opportunities, and expanding the design options for those keen on a more contemporary but naturalistic look. Cluttering it with umpteen brand names does nothing for me. It was a Charcon product initially, but now it's part of the StoneFlair By Bradstone hierarchy which I feel adds the grand total of buggerall to its appeal. It's also burdened or emblazoned (you decide!) with the Aggregate Industries "Life" badge, which means it's green-ish, with either low CO2, high recycled aggs content, SUDS appeal, or a combination of all three. All very worthy and necessary, but how many customers give a Donald Duck about this sort of thing? I've yet to hear a contractor tell me that a client chose a particular product because of its low carbon bootprint. And as StoneMaster moves across the divide from block paver to sort-of flagstone, Panache moves the other way, with the almost inevitable advent of Panache Block Paving. The shot-textured Panache range has proven to be popular and so the move to a smaller format was bound to happen at some point. However, I have reservations about such coarse textured products on driveways. They are all well and good on patios and pathways, but whenever they are used on heavily trafficked pedestrian areas or anywhere that will be used by vehicles, they do seem to suffer from polishing and/or marking, particularly where point turns aided by power steering are common. And obviously, the lighter tones are more noticeably affected than their darker siblings. I raised this with the Bradstone team but they profess confidence that the problem is almost non-existent. I'm afraid I don't share that confidence. Experience tells me that shot-textured light-coloured paving doesn't fare well with tyres. So that's the important new stuff dealt with. I'd better crack on with comments on the brochure itself before this laptop screen runs out of ink. It is a brochure which follows on consistently with those of the last few years. It's A4, full-colour, with exactly 100 pages of loveliness. 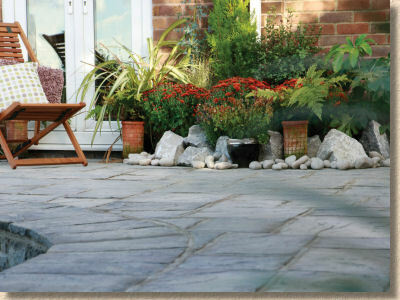 Bradstone are a serious brand, and the quality you rightly expect from such a significant player is evident throughout. Many of the photies are new, and they are never less than excellent. Only one mega-blooper - the e-chuffing-normous crossed joint smack bang in the middle of the full page photie of antiqued sandstone on page 34 - it's not even pointed properly FFS! Where's PotatoShop when you need it? The text is probably a little more verbose (says he!) than in previous years, but this is balanced by it being less of the nebulous, arty-farty marketing speak, and more of the quality, useful descriptive text that gives a real sense of understanding the product. 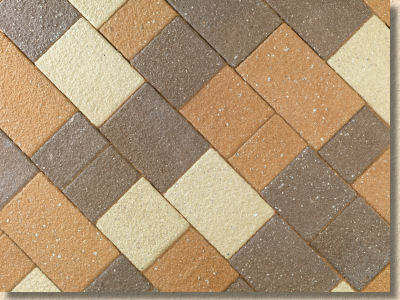 There are more swatches per product, and they are much more representative, showing three or four mini-examples of each product so that the client gets a truer impression of the variation in colouring and texture that inevitably occurs with paving and hard-landscaping. The technical info is restrained, but informative and tidy. It doesn't intrude and turn an attractive brochure into a boring technical manual. In fact, there's a much more informal, magazine-y feel to the whole thing, with substantial sections devoted to how great patios and gardens are designed, and how paving often dictates the overall feel and atmosphere of a garden. There's even a couple of well-deserved pages given over to the up-and-coming designer, Paul Hervey-Brookes, who was nurtured under the very worthwhile Bradstone mentoring scheme they run with yer Chris Beardshaw. There are other developments in the pipeline. After years of having a pretty naff website, a whole new site was rolled out just before close-of-business at Christmas and although it's still being tested, it is a ma-hoo-sive improvement on the previous version. It's very Web 2.0 with a white background, sans-serif font, obvious CMS styling and short, succinct pages with plenty of thumbnail images and links to anti-social media. It's clean, functional, corporate but lacking the distinctive styling I prefer. As the web has matured, it seems that many big-business sites have shrugged-off any individualism and gone for the bland Web 2.0 anonymity where content management (the aforementioned CMS) is king and style is limited to colour of font. I know why it's done; indeed, there has been significant pressure to move pavingexpert.com in that direction, but I can't help feeling that web sites are becoming like our town centres: samey, formulaic and soulless. Still, to be fair to Bradstone, what they now have is easy to navigate, it's uncluttered, it does what they want, which is to deliver info quickly and sure-footedly. Users don't go to such sites to be entertained; they are there looking for guidance and information presented as simply and as lucidly as possible. It's only old stick-in-the-muds like me that like websites to have a unique look and feel. There's also a series of "How To…" videos which are intended to show the basics of patio, walling and driveway construction while simultaneously extolling the virtues of using a professional. They are necessarily short and limited in scope, but having played a small part in the scripting, I know they are accurate and very well put together. I also saw for myself just how many weeks of work (no exaggeration!) are required to produce a 5 minute quality video. Look out for these appearing in the coming weeks and, if possible, I'll post links either here or on the pavingexpert Twittery thing. 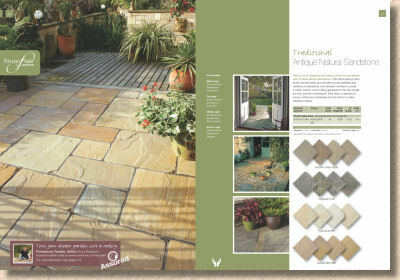 You don't need me to tell you that if you are in any way serious about paving, whether you are a contractor, a designer, a DIYer or just someone looking to upgrade their garden or driveway this year, then you simply must get the Bradstone 2013 brochure. Without it you don't get a full sense of what is available, but more importantly, you would miss out on some genuinely good reading and true inspiration.